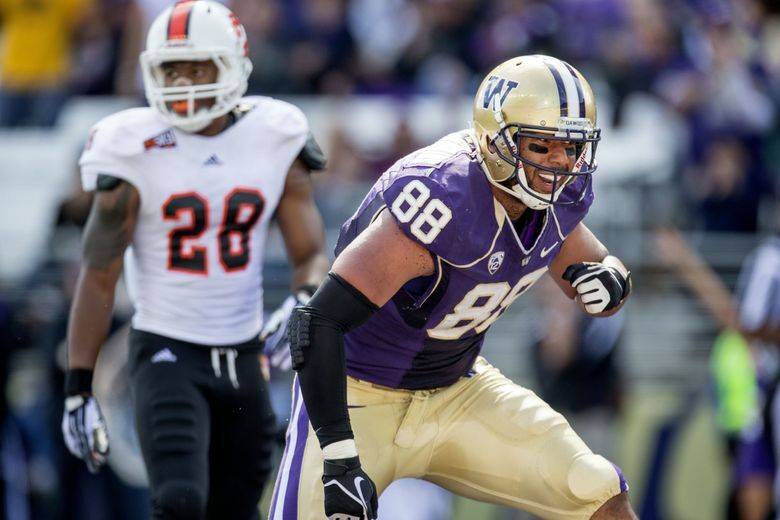 A national report Sunday said the Seahawks will be "very interested'' in tight end Austin Seferian-Jenkins — a former UW standout — when the free agent signing period begins this week. It’s been considered pretty much a foregone conclusion for a while now that Jimmy Graham will not re-sign with the Seahawks and will enter free agency this week and move on. One more piece of evidence to support idea that came Sunday in a report from national NFL writer Jason La Canfora of CBSSports.com that the Seahawks are expected to be among the teams who will be “very interested” in free agent tight end Austin Seferian-Jenkins. On Monday morning, reports surfaced — including from Dave Mahler of KJR-AM — that Seferian-Jenkins is in town and could make a visit with the Seahawks later this week. Per NFL rules, though, Seferian-Jenkins could not visit with the Seahawks until Wednesday, when the new league year begins. That Seattle could show interest in Seferian-Jenkins has also been considered as likely for quite a while, and one reason is Seferian-Jenkins’ ties to the area — he was a standout at Gig Harbor High and then played three years at Washington, also playing one season of basketball. Seferian-Jenkins was taken in the first round in 2014 by Tampa Bay but had middling success there as he also battled alcohol issues and was waived by the Bucs shortly after a DUI arrest early in the 2016 season. Claimed by the Jets, he entered rehab and had a breakout season in 2017 with a career-high 50 receptions for 357 yards and three touchdowns. The Jets want to re-sign Seferian-Jenkins but he is also reported as wanting a contract approaching $7 million a season (Seferian-Jenkins recently changed agents and is now being represented by Doug Hendrickson, who has also represented a handful of prominent Seahawks in recent years including Marshawn Lynch, Michael Bennett and Marcus Trufant). Seferian-Jenkins made $5.25 million on his four-year rookie contract that is now elapsed. Whether he can get that is another matter as there a few notable tight ends on the market led by Graham — whose new deal, whatever it is, could set precedents for every other free agent tight end — Cincinnati’s Tyler Eifer and Trey Burton of the Eagles. And the Seahawks might be reluctant to go that high and possibly cancel out the 2019 compensatory pick they hope to get for Graham. But with Graham expected gone, the Seahawks have some definite needs at tight end. And Seattle wouldn’t be very interested in a tight end who might command that much money if the Seahawks were going to re-sign Graham. Luke Willson is also a free agent for the second straight year and will be hoping to get more than what he ended up re-signing with the Seahawks for — a one-year deal worth $1.8 million. Seattle has only two tight ends under contract as free agency gets set to begin on Wednesday — Tyrone Swoopes, who spent most of last season on the practice squad during his rookie year, and Nick Vannett, a third-round pick out of Ohio State in 2016. The Seahawks obviously can also address the position in the draft and now having nine picks after adding one in the Michael Bennett trade have some more ammo to do so, though the tricky part is that Seattle has only one pick in the top 120 at the moment. That, though, will likely change, and the good news is that while the draft class of tight ends isn’t regarded as being as strong at the top as a year ago, when three were taken in the first round, it’s regarded as pretty deep in the middle rounds, where Seattle would most logically take one given their current situation. Signing Seferian-Jenkins would obviously fill a potentially big hole while also creating a really interesting homecoming story.